Whether you call it "Custom Web Design", "Web Page Design", "Web Site Design" or "Custom Web Development" - David Williams offers a wide array of affordable web design and professional web development services for your small business or organization. 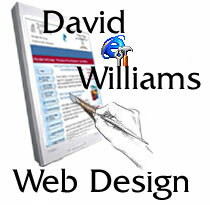 David Williams designs custom websites tailored to your specific needs. We don't use templates or knock-off online software - we build your website from the ground up so that it serves your specific needs for both form and function. Backup of your web site to secure off-site drive/disk. This is a huge offering from a marketing standpoint. Web statistics afford you the ability to look inside the traffic of your website to learn what pages are most popular, the number of pages being viewed, the number of new and/or returning visitors to your web site and more. 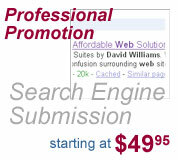 Ask Dave Williams for web statistics for your web site.